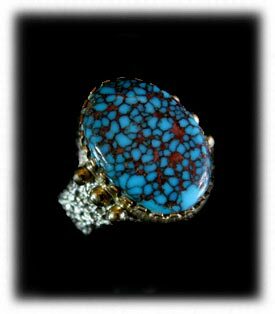 Candelaria Turquoise has become one of the most collectible and desireable Turquoise in the world in recent years. Recent years have produced outstanding material from dumpers who have snuck into the closed Candelaria pit. 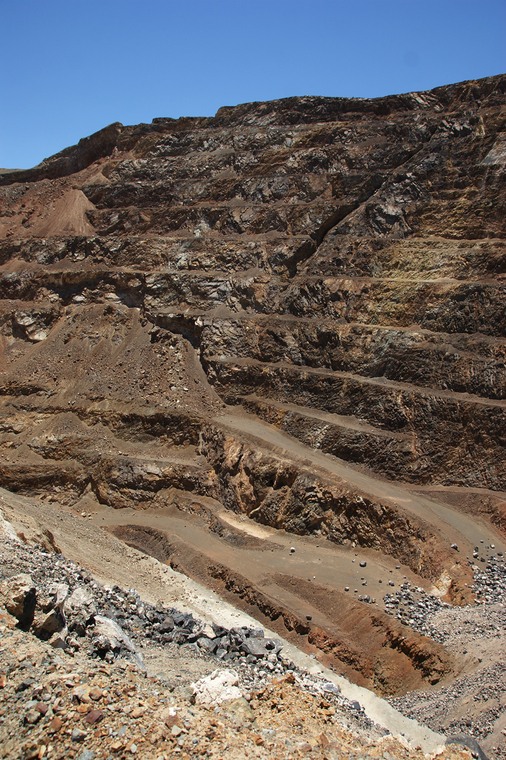 The Candelaria mine(s) are claims located in the large Candelaria Open Pit Copper, Silver, and Gold Mine. The large ore company used to lease out the claims to a few companies infrequently. 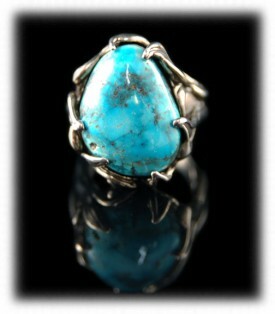 The finest Turquoise is now located in a part of the mine so difficult, that it is almost unattainable. The Candelaria Turquoise is a good quality stone of high blue color with an intermittent black or brown, non-webbed matrix in general. The high-grade Candelaria is a translucent dark blue with a reddish brown spider web matrix. It is a hard, attractive stone. The Candelaria Hills also produce some of the most attractive Varascite, which comes in a wide spectrum of colors. The Candelaria mine has a rich history going back to the middle 1800s.. This is a very hard stone, high silica content. This mine produces some of the most unusual and beautiful stone patterns, no two stones are ever alike. 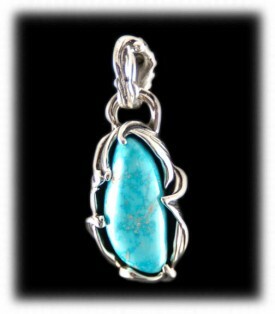 Candelaria Turquoise is very valuable because it is not frequently available and the mine has been closed for many years. It is not certain any Turquoise will come from the mine again. Above are some wonderful examples of different colors of natural Candelaria Turquoise with different matrix patterns. Above to the left is a Sterling Silver pendant by Crystal Hartman with a beautiful sky blue Candelaria Turquoise cabochon. 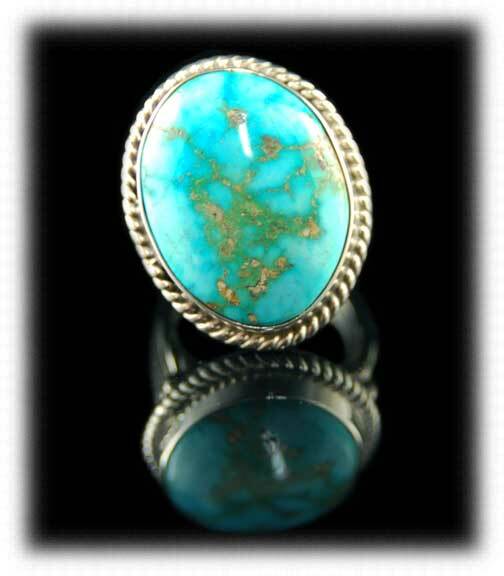 This cabochon is of a standard gem grade "A Grade" and is a good example of standard gem grade natural Candelaria Turquoise. The center picture is of an outstand handmade Sterling Silver bracelet by John Hartman with top gem grade natural Candelaria Turquoise, this stone would be considered "AA Grade". You can tell by the beautiful deep blue color and gorgeous matrix. To the right is a handmade Sterling Silver ring with a beautiful blue to green fade variety of natural Candelaria. Above are three more examples of natural Candelaria Turquoise from Nevada, USA. To the left is a handmade "Lost Wax" style sterling Silver ring by Crystal Hartman with a natural light blue cabochon of Turquoise from Candelaria. In the middle is a top gem grade spiderweb Candelaria Turquoise Cabochon that posses a rare green - blue tint to the Turquoise. To the right is a AAA + grade cabochon of natural Candelaria Turquoise with red spiderweb matrix. This is an ultra rare and super valuable gemstone. 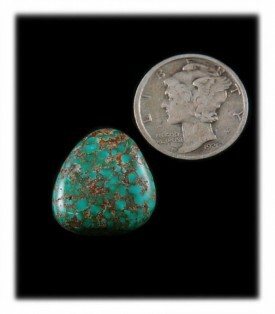 The Candelaria Turquoise was mined in an area not too far from Tonopah, Nevada in the Candelaria Hills. There is little reference toCandelaria Turquoise in the mining literature as the area was mainly known for it's precious metal mining.. The Turquoise in this area was usually found in thin veins and is known for its beautiful almost electric blues sometimes with a light matrix. Some of the material rivaled the bright Blue Gem Turquoise that was used in inlay and Navajo jewelry. Turquoise has been produced in the Candelaria area very sporadically over the years. It was mined along with the silver and gold ore that made Candelaria mining famous at one point in Nevada's history. Mining operations were originally established in 1863 and began being worked heavily by the early 1870's. At that time Candelaria was one of the toughest camps in the West and a terrible place to live, with its high temperatures, high winds and no law enforcement. With the areas low production of Turquoise, Candelaria became known more for its fine Variscite from the small mines which were owned by ma an pa operationas and it is still available. Over the last few years Candelaria Turquoise has been seen again in today's turquoise market. Along with a bright blue material a beautiful dark blue turquoise with red spider web has appeared from older collections and has now been cut and is appearing in fine jewelry. 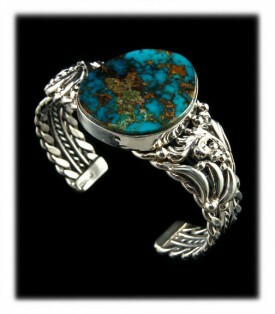 This material rivals high grade Bisbee Turquoise and Persian Turquoise. Candelaria Turquoise is again having its day, with beautiful spider webbed variscite and a wonderful dark blue red spider web Turquoise. mountain, and this pit is enormous. Also, join our Newsletter below as we put out a mailing with more information on Turquoise, Turquoise Jewelry, gemstone silver jewelry and what's going on with our company and the Southwest Jewelry industry. 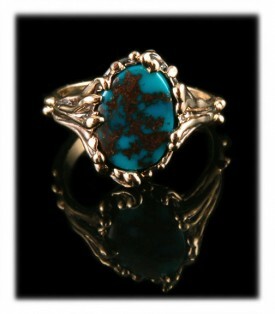 We hope you have learned a little about Candelaria Turquoise.